Ten or so years ago I was fresh out of audio engineering school, which gave me a unique skill set that prepared me for two distinct career paths: working at a car wash or finding a gig at a studio. Luckily there was a studio not far away, nestled in California’s fertile San Joaquin valley that was kind enough to offer me an internship. This particular studio had a Euphonix console, or “control surface” as it was sometimes referred. Previously, I had run signal through some pretty nice boards – Neve, SSL, Neotek – and had a pretty good grasp of signal flow, but I had more than a little difficulty wrapping my head around the basic concept of the Euphonix. So something might have been lost in translation there, but it really doesn’t matter, because these pedals sound like the glorious love child resulting from the unholy union of Unknown Hinson and the Cramp’s Poison Ivy. The Ultron and Ultrem, which were conceived to give the best that both analog and digital have to offer, have transcended that lofty goal and have instead become musical necessities. Watch someone run signal through the Guyatones and notice as their eyes glaze over from the Alpha waves kicking in. Warmth, depth, musicality – that is what the Guyatone Optical series delivers. Starting with the Ultrem, getting signal was easy once the anxiety attack resulting from all of the knobs and switches subsided. Relaxing and breathing into a bag, I set up initially in mono, assuming that is how it will be used by most players, and the results were phenomenal. With six effects modes selectable via soft knob, this box can intuitively dial in any type of trem known to the free world. Trying to get something familiar, I selected a triangle wave, used the tap tempo to adjust rate, set the Saturation and Depth knobs at around noon and selected Wave Tap as the Effect Mode. At that point the Ultrem respectfully demonstrated the concept of completely perfect tremolo. Moving knobs around, I was unable to find any sounds that weren’t useful in some way. With six selectable wave shapes – triangle, sawtooth and various square waves – it can do odd, but never leaves musical territory. More than intrigued, I quickly rustled up another cable and tried it in stereo. I have often wondered how worthwhile stereo rigs are for most live situations, mostly due to how I remember the live venues used to play. In those situations, small, simple rigs that that could be quickly set up and torn down were the rule, making complex effects setups and multiple amps unnecessary luxuries. With this unit, none of that relevant. Run in stereo, whatever obstacles need to be overcome. Engaging the Pan switch will reward you with the thickest, most musical stereo trem effect around. Then came the Ultron. I’ve never been big proponent of envelope filters, but this thing was once again way deeper than it came across initially. It sounds so much more natural than any auto-wah I’ve played through in the past – I am aware that “natural” is really just a backhanded way of saying “organic” again, but it fits. It was easy to quickly dial in a great sound, and the unit was responsive enough to encourage ditching the pick and using thumb and fingers, delivering eerily vocal sounds without a ton of effort. It sounded alternately bitchy or guttural, responding to variations in attack. Five minutes into playing the Ultron, I wanted it as much as the Ultrem, due to the ease in which it is able to cover not only expected auto-wah duties, but also some nice surprises, like cool percolating tones that wouldn’t sound out of place on a mid-‘70s Merle Haggard recording. Guyatone has based the optical circuitry of the Ultron on the iconic Musitronics Mu-tron III, and it shows. What the Ultron has brought to the table is the flexibility of real-time digital control, quiet operation, consistency, and the ability to dial in much more sensitivity than I recall from the Mu-tron. 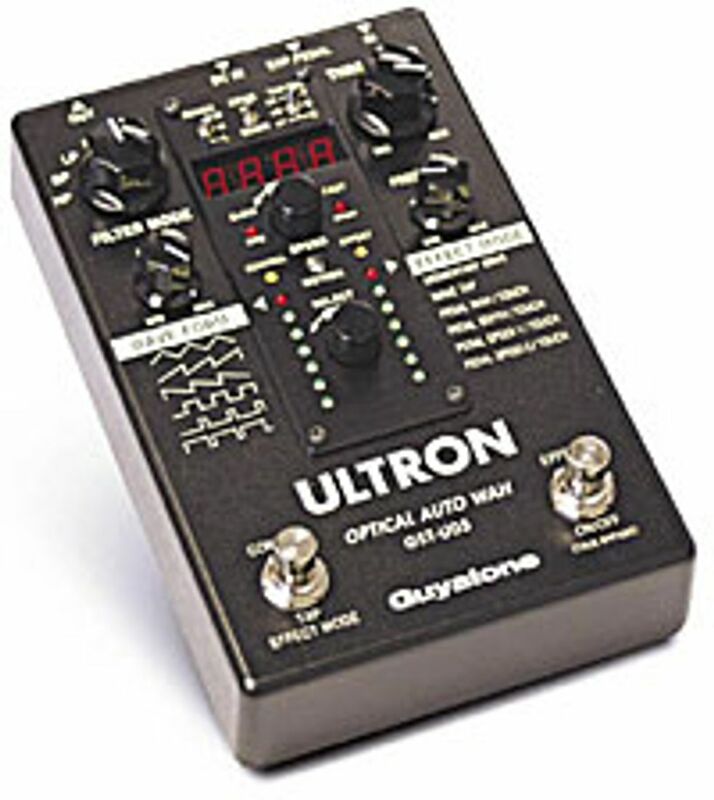 Also, like the Mu-tron III, the Ultron features selectable high-pass, band-pass and lowpass filters. Using the high-pass filter, I was able to get a surprisingly convincing electric sitar tone. 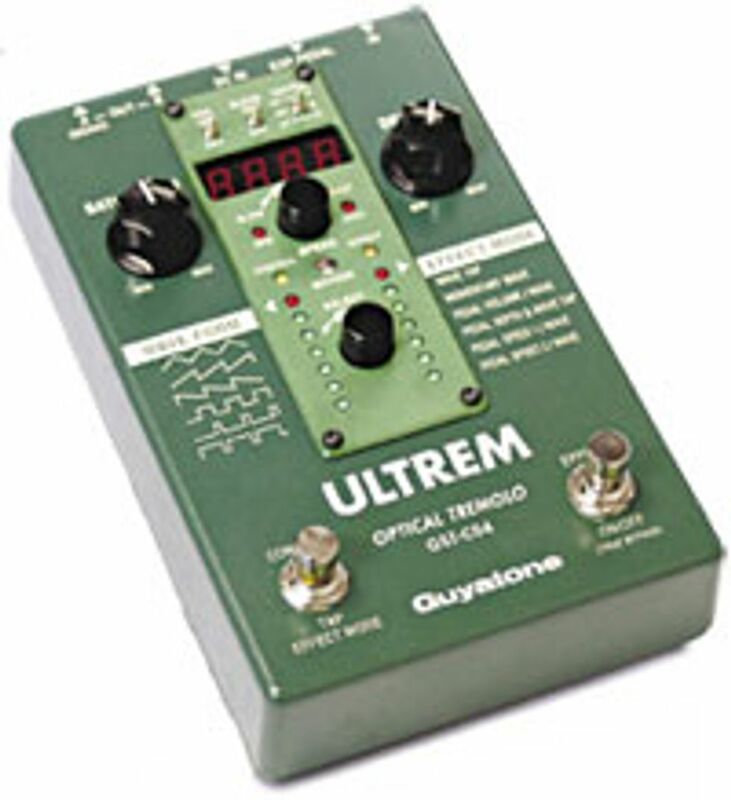 The layout of the pedal is identical to the Ultrem, also offering six Effects Modes and six selectable Wave Forms. The Ultron also features internal dip switches to fine tune the effect for a variety of instruments such as bass or keyboards. What the Ultrem and Ultron share is phenomenal build quality, push-push soft-knobs for both Effect Mode and Wave Form selection, and another handling tempo duties. Solid feeling mini-toggles reside up top, and true bypass switching is featured on both. The units share inputs for an optional expression pedal, as well as featuring Sub- Modes, accessed when in Effects Mode by a quick press of the Control footswitch. The only criticism that could be leveled at the pair is cost, which all things considered isn’t bad. They are by no means cheap, but anything comparable in sound and build quality will cost as much or more.